Years ago there was a young man in Redmond, Washington who said something like “Computers will make life so much easier.” Hum, who was that man? I know! Bill Gates. The former co-owner and founder of Microsoft. In some ways computers do make life easier, much easier. But when they break down… Oh boy! A few weeks ago I wanted a new laptop to replace an old one that I used to have Windows XP on it. 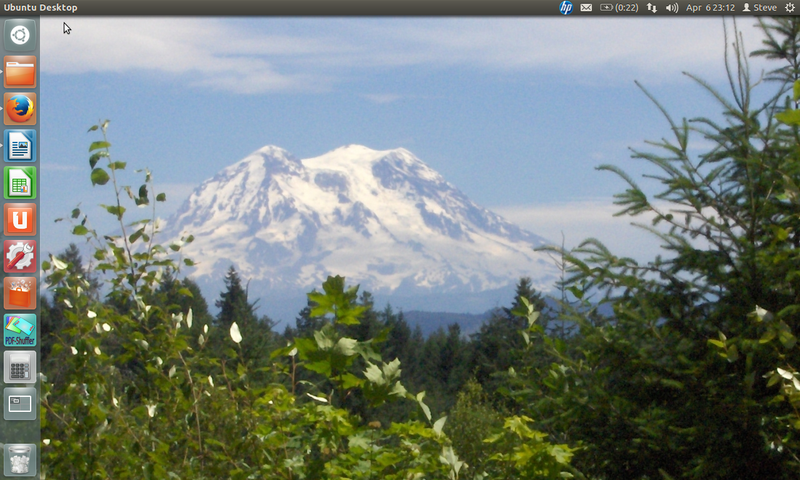 A few years ago I installed a Linux operating system on it and I love it. But this computer is old and I wanted a new one. By the way the bistro is Ubuntu and I have the 12.04 version. After doing some research I decided on a Dell laptop. To be honest I choose the bottom of the line model for four reasons. One, it was on sale. Two, the processor is very Linux friendly which means it will work well with Ubuntu. Three, I am not going to be playing video games, so why pay for a computer that can do that? And four, I do not want a touch-screen. I know many of you are thinking, “OK, So what’s the problem?” When I finally got the new laptop, I noticed that I couldn’t adjust the brightness of the screen. Well I don’t like that, but I could live with it. After I installed Ubuntu on my new laptop, I was happy. But after being online for awhile, my new computer locked up. There was nothing I could do but force it to shut down. The next day I was using it again for a couple of hours, and it locked up again. I called Dell Computer, and found out that even though they can remote access Windows and Apple computers, they can not access any type of a Linux computer. Well Dell replaced the laptop and to my surprise, sent me the second one by next day shipping. (A very happy and unexpected surprise.) Their customer service was great. After I got my new, new laptop, I tested screen brightness, good; and the Wi-Fi, good; and I even left the computer on all day. So far so good. Then somehow I messed up the trial version of Microsoft Office. Oh man, what else could go wrong? Our other computer is a desktop with Windows 7. The monitor is old and wearing out. No big deal, I’ll just replace it. So I bought a new monitor locally, brought it home, hooked it up to the computer and… Hey this thing is worse than the monitor I’m replacing! So back to the store I go for a replacement, only to find out there are no more. They’ll have to order it. Oh great! So now I’m home again and after placing an order for a starter motor for a customer of mine, the old monitor died. Now the desktop computer is useless until I get that second new monitor. By the way I forgot to tell you that the wireless burned out on the old former XP now Ubuntu laptop. And when I installed the software that should make the wireless adapter work with my computer, it didn’t. So in three weeks time, I went through one wireless adapter, two laptops, two monitors, (hopefully the next one will work) what else can go wrong? So now I grab an old paper Bible because after all I still have to do another post on Revelation and, oh no… I can’t believe this. It seems like someone must has broken into my house and replaced the Bibles with ones with small print! Why would they do that? Now I know some of you may say that I’m getting old, but come on. I am no way as old as my parents! Now to answer a couple of questions you may have. Why do I not want a touch-screen laptop? Simple, I am a mechanic and I do not want dirty, grubby, greasy fingerprints on the screen. Next question, how did I do this post? I do have another laptop, but I’m still using the old Ubuntu laptop. To go online I use Netgear Universal Wi-Fi Adapter, model WNCE2001. Thing is meant for entertainment centers, but I use it for my old laptop. Microsoft plans to end support for Windows XP on April 8, but there are still many users whose computers run the outdated software. That’s why the company has asked tech-savvy users to encourage their friends to upgrade their computers or buy new ones. In a recent blog post, the Redmond, Wash., company said readers of its Windows blog are likely running a more modern version of the operating system, but their friends and family may not be. “We need your help spreading the word to ensure people are safe and secure on modern up-to-date PCs,” Microsoft said in its blog . PHOTOS: 10 ways to use the sharing economy Microsoft will no longer run tech support for users of the 12-year-old Windows XP software or issue updates that protect the operating system from viruses after April 8. The problem is many users still run Windows XP and either don’t want to upgrade their machines or don’t know that they need to. In the post, Microsoft said tech-savvy users should encourage their friends to check and see if their computers are capable of upgrading to Windows 8.1, the latest version of the computer software.